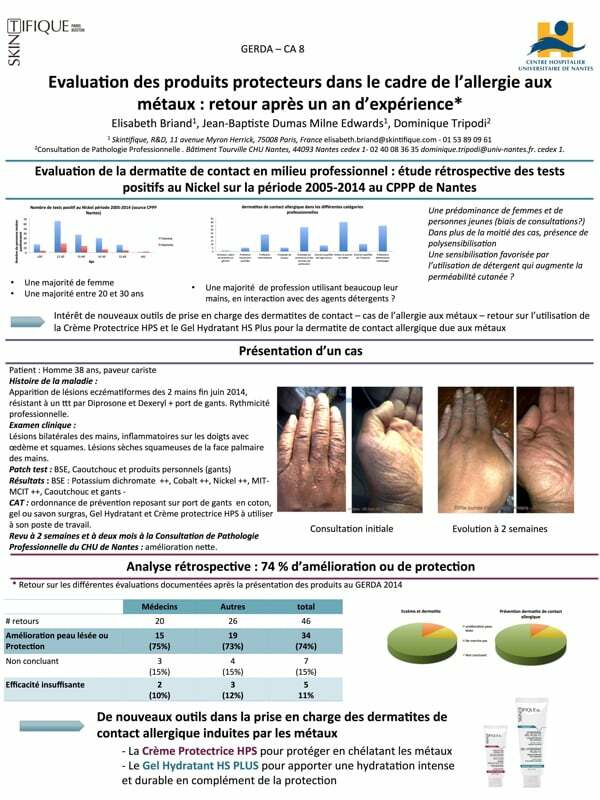 The document below is a poster that was presented at the Gerda Congress (Groupe d’Etude de Recherche en Dermatologie et Allergologie), which was held in Brussels, Belgium, in September 2015. The Gerda being primarily designed for French-speaking physicians, it is written in French. The work presented here was conducted by medical professionals from Nantes Medical School and Hospital, and scientists from Skintifique. Some of the data also build on reports and assessments conducted by a number of physicians in private or hospital practice. We are grateful to them for these contributions. Important note: the document is presented here in order to help medical professionals and scientists in their professional practice; as any document dedicated to professionals, this document, in its format as well as content, requires high medical and scientific expertise to be analyzed and interpreted correctly. Please do not try to draw conclusions from the work presented below if you do not have the appropriate medical and scientific expertise.